Geographical Range: Arabian Desert, Iraq, Syria,,Jordan, North Africa, and the deserts of central Asia. Diet in the Wild: Small mammals and birds, the eggs of birds and reptiles, crabs, scorpions, snails, centipedes, young turtles, other lizards (apparently including their own species), snakes and carrion. These lizards are brownish-yellow with crossbands on the body and tail. The number of crossbands depends on subspecies, but ranges from 3-8 on the body and 8-28 on the tail. There are three subspecies of the Varanus griseus: caspius (Caspian desert monitor), griseus (western desert monitor, and koniecznyi (Thar desert monitor). 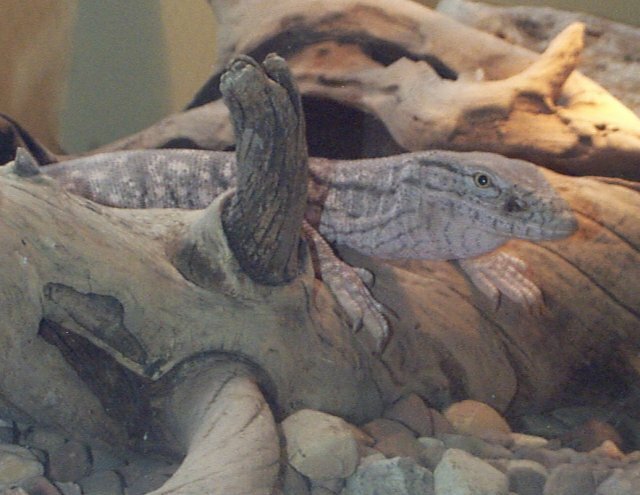 The Caspian monitor is the largest (up to 140 cm and 2.8 kg) and the Thar monitor the smallest (up to about 80 cm and 180 grams). The tail is longer than the body. Males are larger than females. Their nostrils are nearer to the eye rather than to the tip of the snout. These are burrowing lizards and the position of the nostrils helps to keep dirt out. Salt glands help to minimize water loss. They can run up to 20 mph for short periods of time. Reports that this lizard is actually venomous (as opposed to having the bacteria-laden mouth of many monitors) have been unsubstantiated. These lizards are solitary or organized into loose communities composed of overlapping ranges. They maintain large home ranges and may forage up to 2 km from their home burrows. Males hold larger territories than females. Males change home ranges annually, but females may keep to the same range for several years. 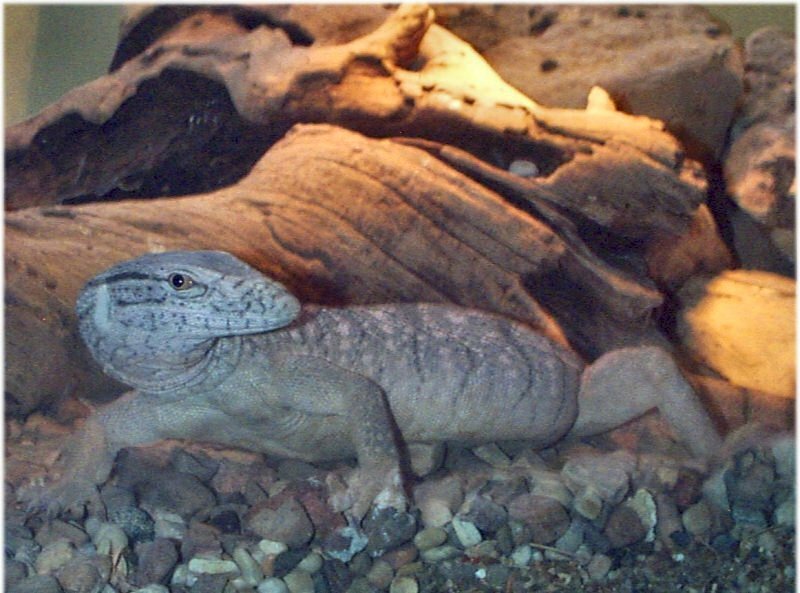 For several months between November and March, desert monitors hibernate in their burrows. 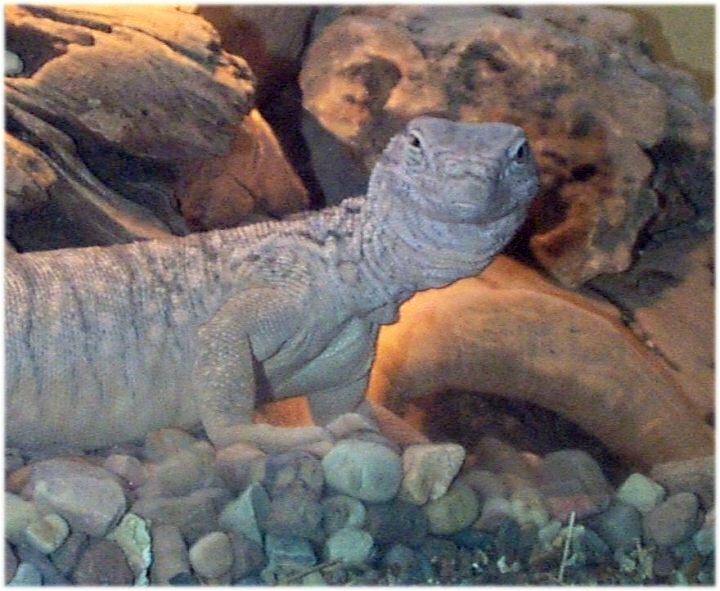 During the hot part of the year, desert monitors retreat to their burrows during the midpart of the day. Mating and egglaying occur in the late spring and summer and hatchlings emerge from burrows the following spring. Incubation period for the eggs is 8-12 weeks, depending on temperature. Tsellarius and Tsellarius have reported extended periods of premating "escorting," but this activity may represent a prolonged unsuccessful courtship of females by males. Gray Monitor: Sedgewick County Zoo. David Bennett. Little Book of Monitor Lizards.